Mei and her delightful pets Little and Lo return for the third chapter of their adventurous life together. Although the story features characters from the two previous stories, this book can stand on its own. As the family prepare for their Chinese New year celebrations, their joy is shattered by the news that village is threatened by plans to demolish it to build a freeway through it. This is the only life that Mei and her neighbours have known, the place their forebears have lived and worked for generations. They love and cherish their town even though the bureaucrats sneer at its backwardness. Readers will cheer as Mei stands up to the truly nasty deputy director and tells him to leave them alone. But her courage seems to be for nothing. All around them, villagers are giving up, selling their properties and leaving. 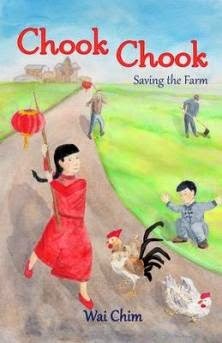 Mei and her brothers hatch a plan to save their village by getting it registered with the National Preservation List of Traditional Villages – a process which involves demonstrating its cultural uniqueness. Will the chooks help – or hinder their attempts? Chim’s story weaves details of the daily life in China, such as the joy of Chinese New Year and the associated customs, and demonstrates that it is the little details, the things we take for granted, that define us and make our lives unique. A fun read for younger children. I wonder if Chim plans a fourth instalment.